Given that the AT-LP120 USB seems to be the most popular entry level turntable that also offers a reasonable degree of quality, here’s some additional information and third-party reviews. The Audio-Technica LP120-USB is a worthwhile turntable for record enthusiasts, amateurs, collectors, archivists and everyone in between. 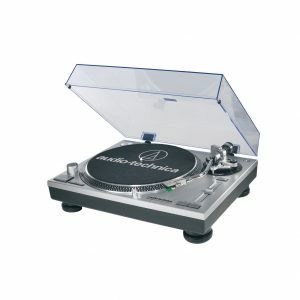 The Audio Technica AT-LP120-USB is a well-made, feature packed, “ready to play” inexpensive turntable that is a significant step up from the plastic crap competition. The lightweight platter is clearly one place Audio Technica saved some money, and perhaps it more than anything else accounts for the startlingly soft, but pleasingly lush sound. Measuring [it’s] performance using $30,000+ worth of equipment, we’ve determined that the Audio Technica AT-LP120-USB is the best turntable for most people. For only $200, this turntable packs a pretty powerful punch with a solid (albeit polymer) build and a few nice on-board DJ features as well. The Audio-Technica AT120 is becoming popular because of its sound quality, durability, speed accuracy and reasonable price. You can’t really get a better turntable for this price. The Audio Technica LP120USB is a sturdy player that not only plays records but can copy vinyl straight to your hard-drive. Balancing performance, price, and quality, Audio-Technica is one step closer with its release of the AT LP-120.